For the Blogger Kid's birthday, we headed down to Echo Park for breakfast at the new Square One Dining location there (where we also sent folks for food before the start of the Great Los Angeles Walk last month). After enjoying cheesy grits, a squash blossom breakfast burrito and toast with Sqirl jam, we decided to try the lake's famed pedal boats. At $10 for adults and $5 for kids, it's not a bad deal for a full hour of pedaling around the lake. 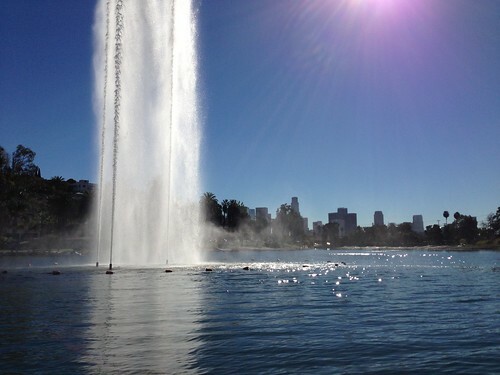 It was a beautiful Christmas Eve -- almost too hot -- so the mist coming from the Echo Park fountain was welcome as we floated right up to it. 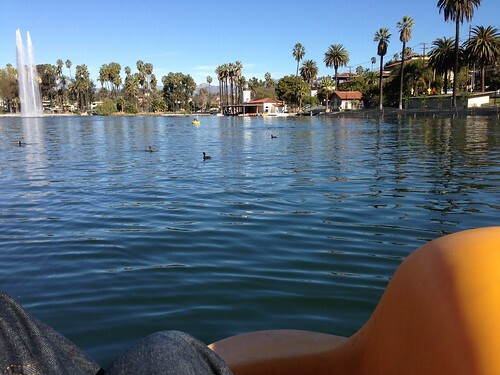 It’s been about four years since the last pedal boats skimmed across the surface of Echo Park Lake after the city dry docked the boats to save money. But on Saturday morning, the public will once again be able to rent a pedal boat at the park as a new boating company prepares to launch a fleet of bright yellow boats into the waters of the newly reopened lake. 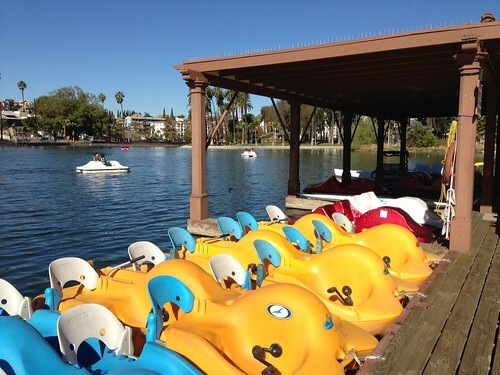 The boating company, Chaffey and Reeves, which has operated boating concessions at Atascadero Lake and at Redondo Beach, will also deploy a gondola and a seven-person outrigger canoe at Echo Park Lake. 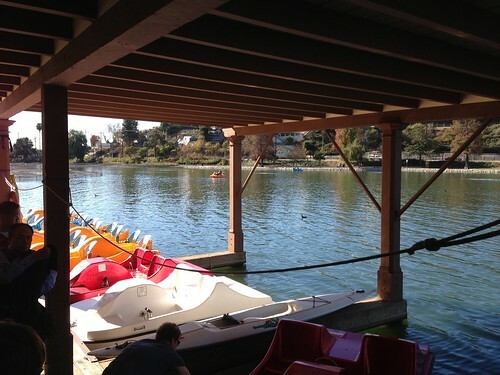 But 10 pedal boats will make up most of its Echo Park Lake fleet. By the way, we were also concerned about how the lake's recently replanted lotus plants looked, well, dead. But per the L.A. Times, they're simply "resting." I hope that's right!